What thrills me the most about the Long John Jamboree is the enthusiasm the board and all the volunteers have for the events. Year over year the Jamboree gets strong and better. 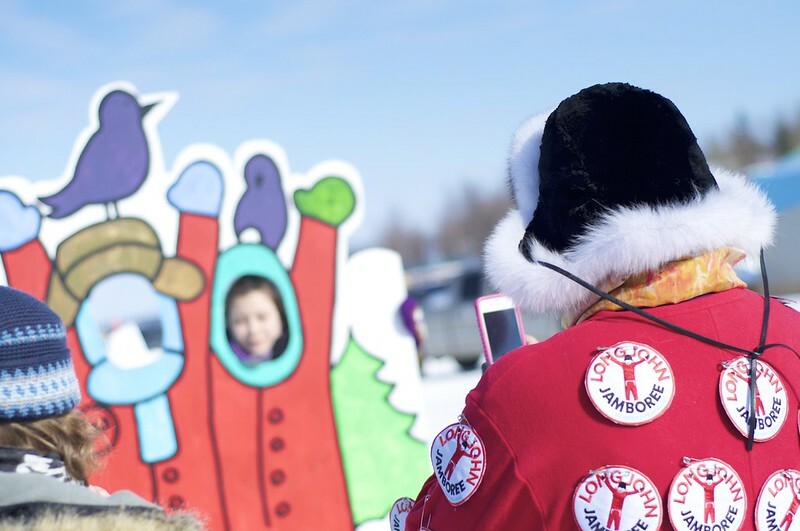 Winter festivals are a time to celebrate the coming of spring and they have been happening for as long as Yellowknife has been around, so grab your kids, grab your wife, grab your hats and mitts and let’s get this thing started. To fully maximize your fun time at the Jamboree I have tried to compile a guide to the Jamboree. If of course you see something worth adding, you let me know below in the comments. Well I did write the “How to Survive Winter in Yellowknife Guide” and in that it does cover the essentials of dressing for winter. I will however note a couple specific to the Jamboree. From year to year the weather can range quick a lot. Some years it can be a bitter cold, while other years things can practically be melting. My advice is to always dress in layers. Layering is essential for winter dressing and allows you to quickly adjust to whatever temperature is at hand. I will however also mention that where the Jamboree site is located on Yellowknife Bay, if there is southern wind you best watch out. Sunglasses are also a good accessory. It does get bright down there on the ice. Remember to check the weather conditions on Environment Canada. There is a food tent down at the Jamboree site that features some of Yellowknife’s more unique food vendors. If you are coming down to the Jamboree site for the afternoon remember to bring some cash for some grab. Oh, and the Sugar Shack, because everyone needs some maple syrup on a stick. For the adults there is also the Brrr Garden. There is always something going on down at the Jamboree site but it is good to know the schedule ahead of time and know when the big events are taking place. Roughneck Relay – Tea boiling? Log sawing? Northern Music Showcase – An event packed with Northern talent. Northern Sled – Who has crafted the best sled for the epic hill? Minute To Win It – Do you have what it takes? Dene and Inuit Games – Take in the culture of the north with these game demonstrations. Skijoring Race – Which team will have the partnership to win? Server Relay – A most epic battle of the most epic of customer service. There will also be the Dog Derby starting every day at 1pm, Ice Fishing tours, Twin Otter Tours and an Iglu Building competition. For the kids there is always a handful of events including storytelling, crafts and face painting and a magic show. To find out about all of the events go to longjohnjamboree.ca and look at the official schedule. Here is what I have learned over the years. Between today and Saturday the carving teams will be working on their carvings right down on the Jamboree site. 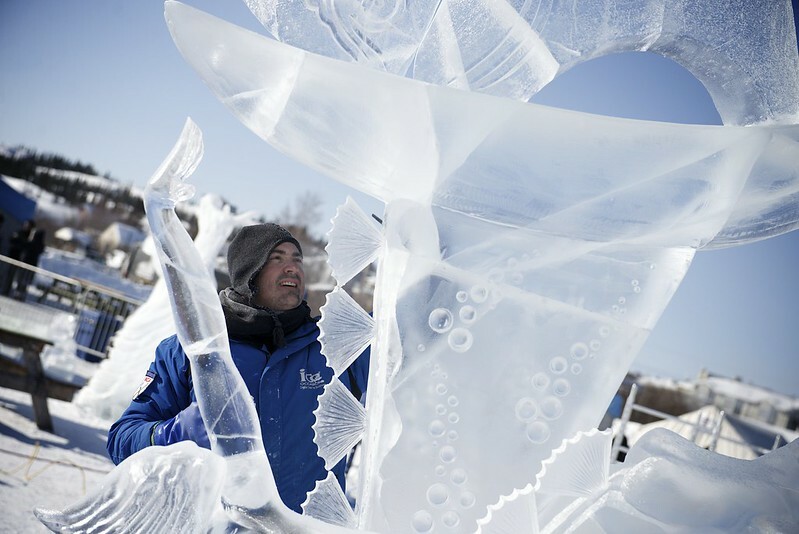 While you’re on the grounds you can watch them work away to perfect this sculptures. On Sunday you can head down and view the finished work. The ultimate time to view the carvings though is at night (or in the evening) when they are backlit and beautiful. So plan on taking a walk through Saturday evening after Fire and Ice. Fire & Ice is one part music, one part burn and one part fireworks all on Saturday night. 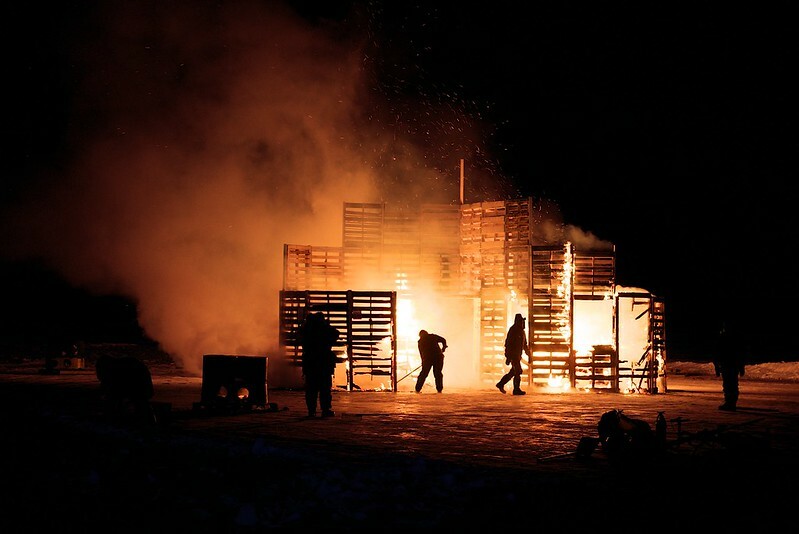 The music starts playing at 7pm at the Jamboree site, the Burn on the Bay, where a large wooden structure is burned, will be at 8:30pm and the fireworks show will be at 9pm. Things to note about watching this event, specifically things we can learn from last year, walking is easier than trying to drive closer. This year the burn object is much closer but I suspect there will still be parking and vehicle issues out on the ice. If you plan to walk, dress warm, but you’ll be better off and avoid the traffic congestion after the show. And sometimes the best place to view both the burn and fireworks is from farther back, or up on a hill. 150 Canadian Championship Dog Derby – Mass start each day (Friday-Sunday) at 1pm in between the Snow Castle and Dettah Ice Road. Check out the full Jamboree schedule here. If all else fails, put your long johns on and just have a chillin good time.